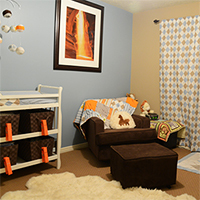 The nursery that I have spent a long time painting and the decorating was finally complete… except the closet was one ugly mess. 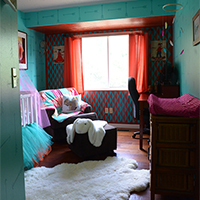 It was so disorganized and cluttered that I didn’t even want to include a photo of it before its makeover. I wanted to do something cute with it that matched my nursery’s color scheme but couldn’t figure anything out. Then I found these darling Tulip for Your Home stencils, paints, and fabric decor ideas. They are on Amazon here. 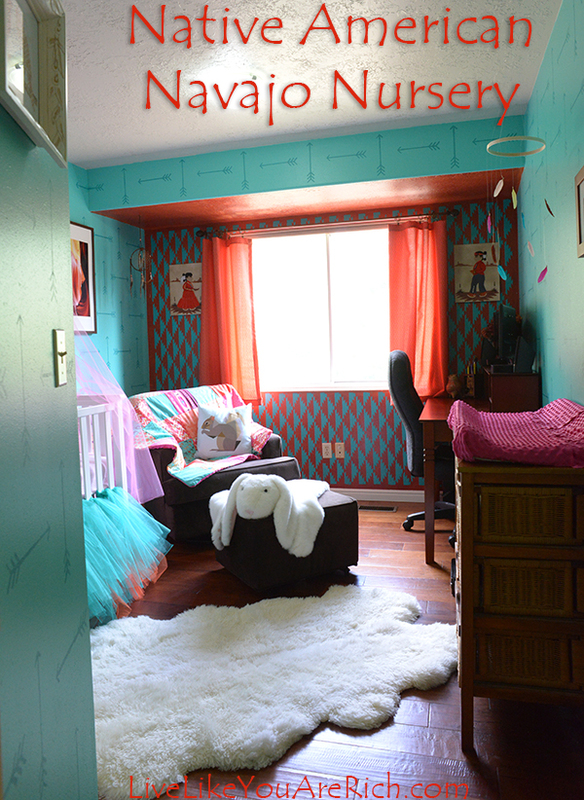 And they had perfect colors of paint that would match the nursery! This is what the nursery colors and theme look like. I used a coral, turquoise, and bright pink color scheme. So when I saw that Tulip for Your Home had all three of these colors and darling stencils I realized that a cute closet may be possible after all! 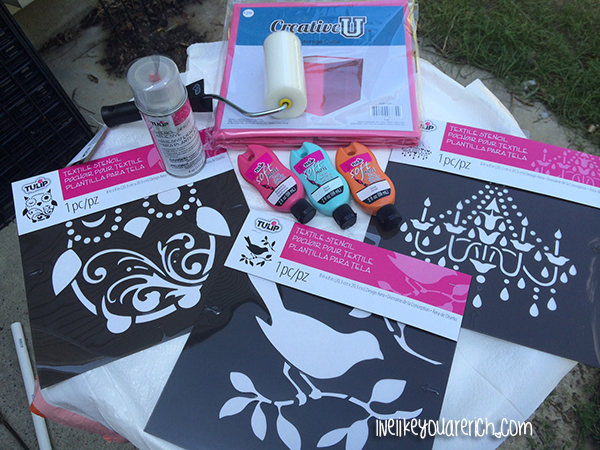 I bought 4 Tulip Stencils 3- 8″ stencils and 1- 14″ x 14″, 1 Tulip paint roller, Tulip stencil adhesive spray, and a three different colors of Tulip paints: Coral, Aqua, and Raspberry. 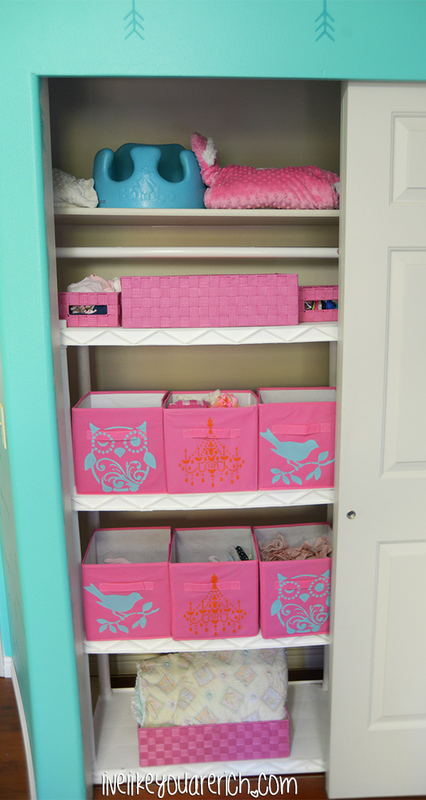 I also found storage totes in Joann’s and a closet shoe holder on sale. 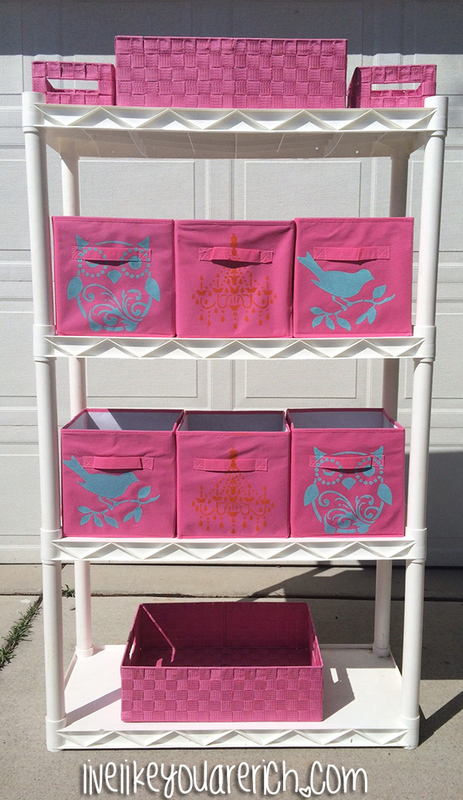 I bought a laundry hamper with great reviews on Amazon and I found a storage shelving unit for the totes in like new condition for a few dollars at a garage sale. First, I took the totes and the Tulip stencils I bought that fit them and I sprayed the stencils with the spray adhesive. Spray the back of the stencil very lightly with the adhesive spray, a little goes a long way and sticks very well. 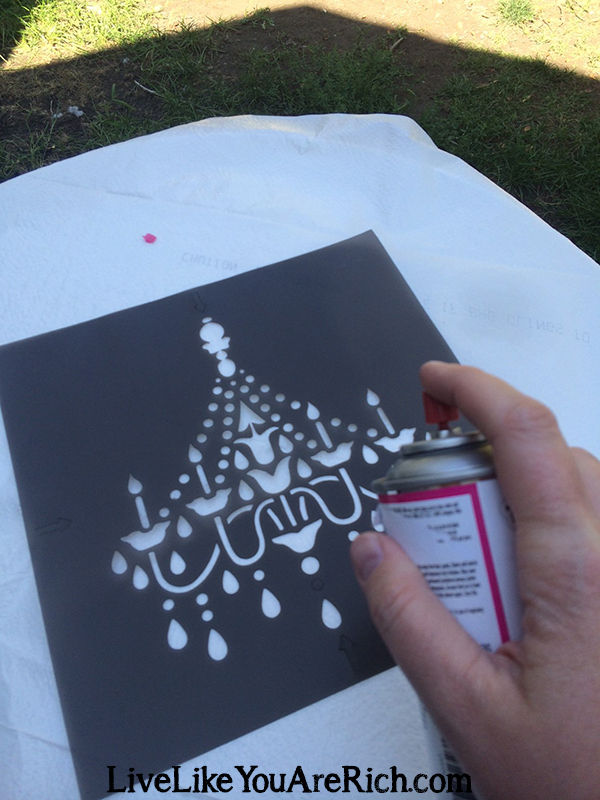 Then stick the stencil on the fabric you want to paint. 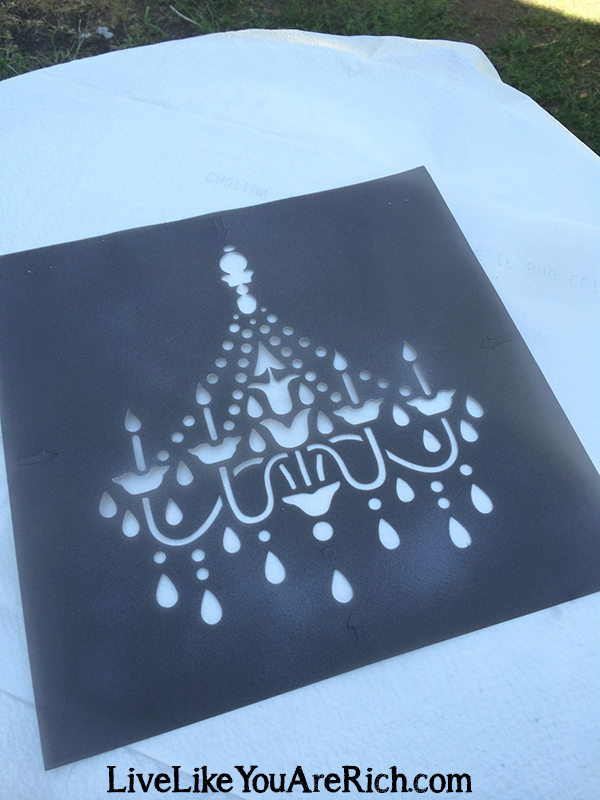 The spray adhesive really helps to hold the stencil in place and prevent any leaks. 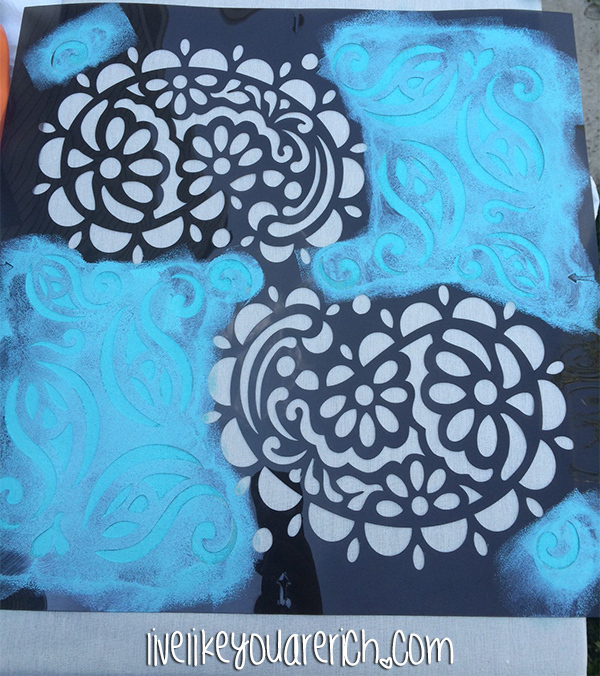 Third, use the roller and paint the stencils/fabric very lightly. Allow a few minutes for the first coat to dry. If you want a transparent look, leave it at one coat. If you want the design to be darker paint at least two coats. The Tulip paint is specifically made for material. I loved the way it went on so well. It is high quality paint. I would recommend buying more than you expect that you’ll need. I didn’t run out but I came close. The fabric really absorbs the paint well so you will need more if you are painting fabric than say a wall. 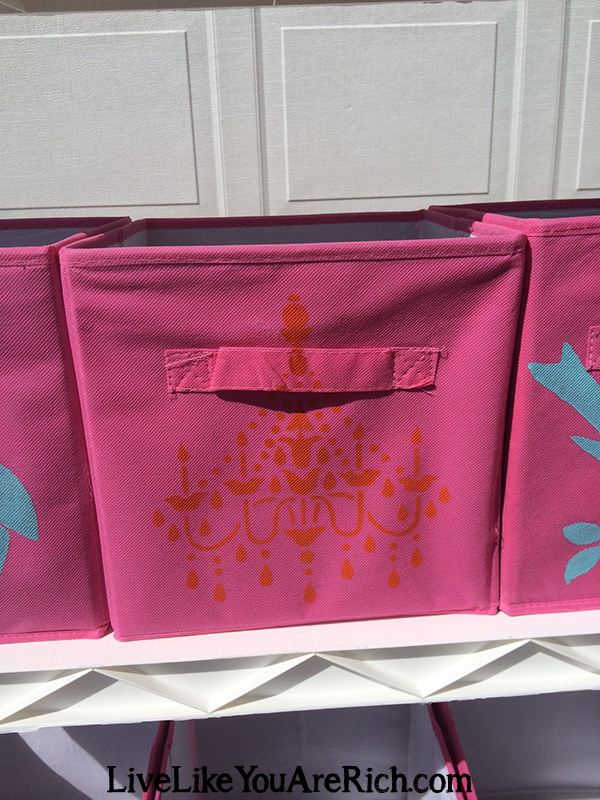 Next, I used the stencils on the other 5 totes and created a pattern that I liked. 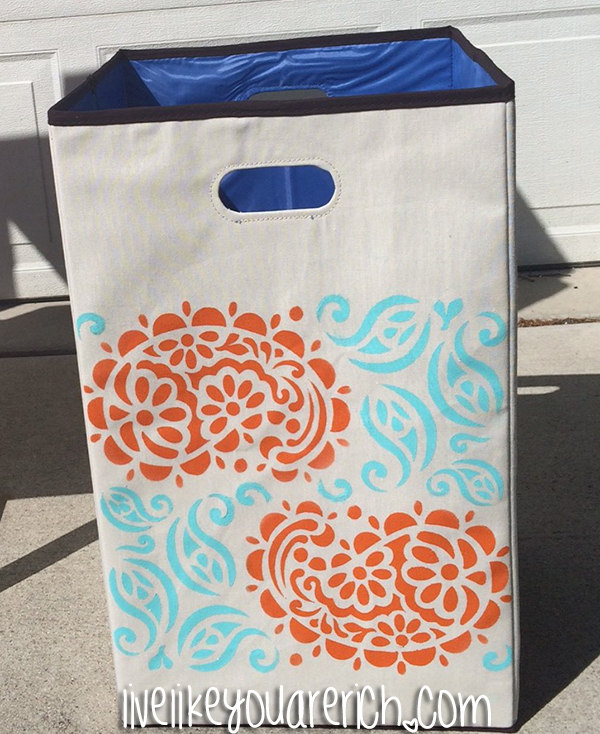 After the totes were finished, I took the large stencil and painted the laundry hamper. I wanted two different colors for the pattern. So I first painted the turquoise and after I painted the coral. Finally, I moved everything into the closet and organized my soon-to-be daughter’s clothes into newborn to 3 month old sizes. The larger sizes I have stored and will switch them out as she grows. My son’s nursery closet was organized with totes and shelves in the order mentioned below. I found that it really worked well! So far I have been using this system to keep his clothes organized for 2 years and everything is always very easy to find. This is the order in which I organized my daughter’s closet. Top shelf: Baby changing pad cover, Bumbo, and a carseat built in blanket and other items that I’ll need to add as I acquire them. Hanging: Nice dresses that I don’t want creased. Perhaps I’ll hang a few coats as well. Top row: 1st- hats, 2nd- two piece matching outfits, 3rd- headbands and hair items. Second row: 1st- tights, 2nd-onsies, 3rd-pajamas. Third row: 1st-tops, cardigans, etc. 2nd- leggings, pants 3rd-shorts, and skirts. Fourth row: baby blankets and burp cloths. Obviously for a boy it was slightly different. This is what I did for my son’s nursery closet… sorry for the blurry photo. Top shelf: miscellaneous items that I rarely used. Fourth row (I didn’t use totes): 1st- baby wipes, 2nd- baby lotion, Desitin, etc. (when he got older I moved these items to the top shelf and put books in this cubbie), 3rd and 4th- older clothes he hadn’t grown into yet. The tote system is so easy to organize. 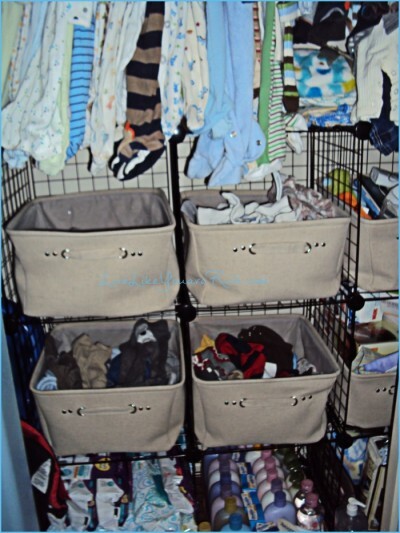 They are easy to pull in and out, to seperate, organize, and access everything without having to fold the clothes meticulously. It works great for a busy and efficient parents. On this side of the closet I have her socks on the top row of the shoe holder and shoes in each one, nice dresses, and a laundry hamper. 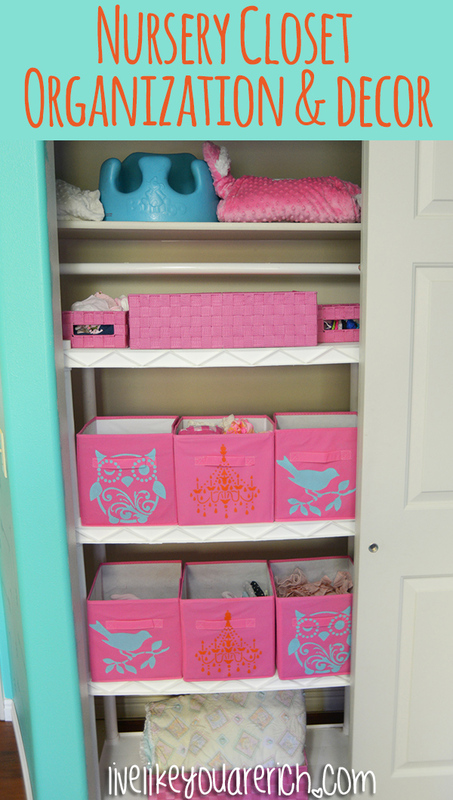 This was an inexpensive, yet very quick organization project. I am very happy with the way it turned out and with the Tulip for Your Home stencils and paint it turned out much cuter than I could’ve imagined.